For foodies and lovers of bountiful meals, Thanksgiving is likely one of the greatest times of the year. For those watching their waistlines on the other hand, Thanksgiving may be as welcomed as a hair in their soup, derailing all of their efforts and good intentions to stay on track. With the average Thanksgiving dinner becoming larger and more opulent than ever with all kinds of new recipes and "fixins" to add to the table, it may seem like Thanksgiving dinner is one just big calorie, fat and sodium filled bomb. But surprisingly, according to new research, it may not be as bad as you (me or anyone) might have thought! Healthzone.ca sent a Classic Canadian Thanksgiving dinner of Roasted white meat turkey (300g), Gravy (Knorr Classic Roast Turkey - 1/4 cup), Cranberry Sauce (Ocean Spray Whole Berry - 2tbsp) Stuffing Mix (Kraft Stove Top Turkey - 1/2 cup) Frozen corn (1/4 cup), Green bean casserole (made with Campbell’s Cream of Mushroom Soup - 1/2 cup), Mashed potatoes (made with butter and milk - 1/2 cup), a white dinner roll, a pat of butter, and a small serving of pumpkin pie (1/8th of a 10'' pie) with some Light whipped cream (Irresistibles - 2tbsp) to the lab to be analyzed. What they found was (are you ready?) that the entire meal clocked in at 1,125 calories, 31g fat, 1,554mg sodium, 70g protein and 143g carbs. While that might seem a bit on the high side for just one meal, it's actually very good! The average woman needs about 1500-2000 calories per day, while a man needs more - about 1800-2500. In terms of fat, women should aim for about 65g per day while men need about 90g per day. In terms of sodium, we should all try to aim for 1500-2300mg per day. So this meal isn't so bad, right? Now, before you dig in, it's important to note that you've still got to be sensible about what you put on your plate. You should try a little bit of everything if you feel so inclined - don't deprive yourself particularly if everyone else is enjoying themselves and you want to join in - but be sensible and moderate with your choices. Be sure to take as many veggies as you can and fill up at least half your plate. One quarter of your plate should be for turkey, ham or other sources of protein and 1/4 should be for grains and starches, including potatoes and stuffing. Watch your use of cranberry sauce and gravy as they may add plenty of extra calories, sugar, fat and salt to your plate. In addition, try to limit the amount of salt that gets used if you're preparing the dishes. If not, don't add any to your plate since there's already likely been plenty used behind the scenes in the preparation of the dish. Avoid using high-fat dairy products like butter or cream in your meal and choose skim or 1% milk or fat free Greek yogurt instead. Choose olive oil, canola oil or soft, non-hydrogenated margarine instead of butter. Now remember, if you go back for seconds, you're doubling the entire score! 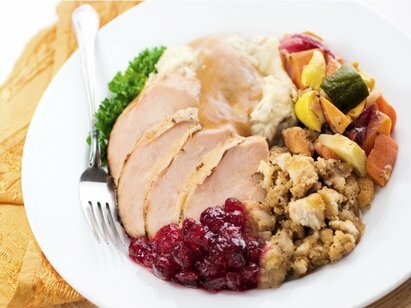 It might seem like round 2 or 3 is a good idea at the time, but there are usually plenty of leftovers that taste just as good, if not better, the next few days after the big event. Take it easy and you'll enjoy yourself while having absolutely nothing to regret. Cheers!